First there was the car accident that claimed his beloved wife. Then came the gruelling months of recuperation from his injuries. Now his constant companions are ghosts seeking worldly release. His new home is haunted by the ghost of a young girl demanding his help. His friends and neighbours are under attack by strange, destructive forces. Who is the Angry Man who haunts his dreams … and what does the demon behind it all want of Simon Guthrie? Set in the eastern Ontario village of Coburn Falls, a fictitious stand-in for Westport, Ontario on Canada's world-famous Rideau Waterway, THE GHOST MAN explores one man's struggle with loss, a near-death experience (NDE), and the ongoing challenge of coming to terms with the fact that he has become a passive medium who must help the unsettled dead cross over to the other side. 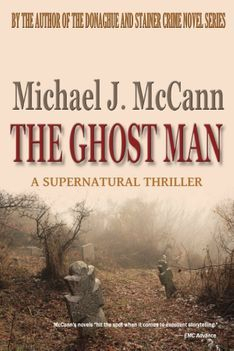 Ask your local independent bookstore to order THE GHOST MAN in paperback for you. It's available world-wide through the Ingram catalog.